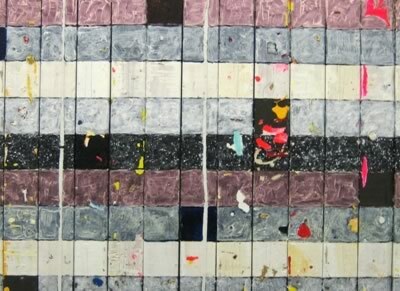 New York artist Cordy Ryman uses traditional and non-traditional media such as wood, metal, paint, staples, felt tip pen, velcro and floor sweepings in a practice that merges bricolage with the disciplines of painting and sculpture. 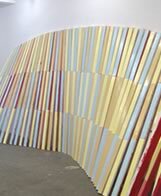 The use of such materials and Ryman's unrefined finishes underline creative process and lend his work an impromptu, almost nonchalant quality. 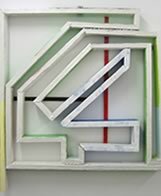 Nevertheless, whether creating site specific pieces, or works evolved without predefined outcomes in mind, Ryman's practice is more complex than it might at first appear. With many of his wall pieces operating as reliefs, three dimensionality is a constant consideration, and Ryman's favoured rough-hewn, angular offcasts lend themselves to loosely architectonic form. Indeed, his constructions appear to be as much about construction - the pairing and organisation of often discordant building blocks - as the decorative results which emerge.